Edit: Yeah, didn't see much from the replay. Last edited by DevinHarriswillstart; 02-06-2019 at 08:48 PM. Brunson needs to hit a three or two. He's not fooling anybody with that fake and drive every time. Well he can't seem to finish the play. Lack of quickness and athleticism is the main issue. Last edited by Skywalker; 02-06-2019 at 08:52 PM. He's been to hesitant to pull the trigger on the 3 at least once. If he can hit one or even two, then the defender will bite more on the fake, and he'll have a better chance on the drive, but yes, he does still need to finish. A dime by Barnes!!!! Woohoo!! Mavs can't shoot the defense is nice. Damn, hope Brunson is okay... We're out of guards. Brunson with a hamstring injury? Yeah, energy is great on defense. With Luka out, ball movement really stagnated a bit. I can't believe he's played so little of the 1st qtr. Harris is about it -- Burke is probably too new to run RC's offense. That Luka to THJ connect has me excited about that pickup. Last edited by Underdog; 02-06-2019 at 09:02 PM. THjr looks more athletic than I thought. His defense has been ok so far. That Luka to THJ connect has be excited about that pickup. His defense has actually decent thus far in the game. Keep it up. Cautiously pessimistic for the 3pt contest. Luka Doncic is exactly what Tim Hardaway Jr's career needed. God...Luka is so good its just amazing to watch. The defender and everyone knows what’s about to happen and they can’t do anything about it. I've never seen him play much, but I like that he pulls the trigger on the open 3. Luka will find him if he's open, so now he just needs to knock them down. He should be a lot more efficient with the better looks from Luka and the Mav offense. 3 mavs hit the floor and not one foul. 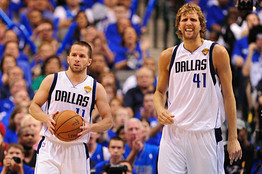 The Mavs look so much quicker and bouncier without Wes and DJ. Luka is going to kill it on the boards with DJ gone. Agree. Totally different team, and a whole lot more fun to watch.